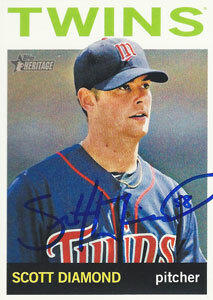 • ESPN’s Darren Wolfson reports that free agent left-hander Scott Diamond (Guelph, Ont.) threw for the Tampa Bay Rays on Friday. With Alex Cobb, Drew Smyly and Alex Colome sidelined with injuries and ailments and Matt Moore still recuperating from Tommy John surgery, the Rays are looking to add rotation depth. The 28-year-old Diamond, who made 27 and 24 starts for the Minnesota Twins in 2012 and 2013 respectively, split the 2014 season between the Twins’ and Cincinnati Reds’ Triple-A affiliates. • It wouldn’t be a good week to ask Bo Schultz if baseball is fair. In six relief appearances for the Toronto Blue Jays this spring, the 29-year-old right-hander, who was claimed off waivers from the Arizona Diamondbacks on October 7, hurled eight shutout innings and allowed just one hit. For his efforts, he was sent to minor league camp on Thursday. • Former Blue Jays second baseman Orlando Hudson served as a guest infield instructor for the Arizona Diamondbacks this week. The Darlington, S.C., native, who hasn’t played in the big leagues since 2012, told reporters that he plans to mount a comeback in 2016. Hudson suited up for four of his 11 major league seasons with the Blue Jays. The two-time all-star and four-time Gold Glove Award winner has hit .273 in 1,415 games during his major league career that has also included stops with the D-Backs, Los Angeles Dodgers, Minnesota Twins, San Diego Padres and Chicago White Sox. • Ask autograph collectors and they’ll likely tell you that former big leaguer Kevin Reimer is a tough signature to obtain. The Enderby, B.C., native, who belted 52 homers in parts of six big league seasons from 1988 to 1993, generally doesn’t respond to his fan mail. But I recently ran across this story in the Amarillo Globe-News that describes how Louisiana-based fan Jeremy Telford sent a letter and a baseball card to Reimer in 1991 asking for the Canadian slugger’s autograph. Telford didn’t hear back and over time forgot about the request until June 2011 when a woman came into Dowling’s Smokehouse BBQ – the restaurant Telford now owns – in Ruston, La., to deliver a piece of mail addressed to him. The woman lived in the house that Telford had moved out of 12 years earlier. Telford opened the envelope postmarked May 21, 2011 – 20 years after he sent his request – to find the card autographed by Reimer. • Call it the Cooperstowners in Canada jinx. Last week I noted that three former Blue Jays relievers (Brandon League, Dustin McGowan and Sergio Santos) and Canadian southpaw Erik Bedard (Navan, Ont.) might be in the Los Angeles Dodgers bullpen this season. In the ensuing seven days, League was shutdown with soreness in his throwing shoulder and will reportedly be out at least a couple of months, while Bedard will be sidelined for four-to-six weeks with a strained back. • Regina, Sask., native Dustin Molleken was reassigned to the Cincinnati Reds’ minor league camp on Thursday. Heading into his 12th professional season, the 30-year-old right-hander has yet to pitch in a big league game. On the surface his 1.50 ERA in six innings this spring appears solid, but he also walked five batters in those six frames. Molleken spent 2014 with the Milwaukee Brewers’ Triple-A Nashville Sounds where he posted a 4.86 ERA in 54 games. He previously pitched in the Pittsburgh Pirates and Colorado Rockies organizations. • Paul Hoynes of the Cleveland Plain-Dealer reported on Tuesday that former Montreal Expos left-handers Scott Downs and Bruce Chen and ex-Blue Jays right-hander Shaun Marcum will not make the Cleveland Indians to start the season. Chen and Marcum both have opt-out clauses in their contracts that allow them to reject minor league assignments and become free agents, but it’s a different scenario for Downs, who also pitched for the Blue Jays for six seasons. “Unlike Chen and Marcum, Downs ended last season on a big-league contract with Kansas City,” writes Hoynes. “If the Indians do not release him with at least five days left before the season opener, and he is not on the 25-man roster or the disabled list, he’ll receive a $100,000 bonus and go to the minors with an June 1 opt out date.” All three pitchers remain in big league camp and are pondering their options. • In other ex-Blue Jays news: Ryan Roberts and Jeremy Accardo were released on Saturday by the Kansas City Royals and Arizona Diamondbacks respectively. The 34-year-old Roberts has hit .243 in parts of nine big league seasons with the Blue Jays, Texas Rangers, Diamondbacks, Tampa Bay Rays and Boston Red Sox. Accardo, who recorded 30 saves for the Blue Jays in 2007, last pitched in the big leagues with Oakland in 2012. He has split the past two seasons between the Washington Nationals’ Triple-A Syracuse Chiefs, the Mexican League and the independent Atlantic League. • Get well wishes to 2012 Canadian Baseball Hall of Famer Rusty Staub who has bowed out of the Montreal Baseball Project’s All-Star Gala this Wednesday to undergo a surgical procedure. The nature of the operation has not been disclosed. “Le Grande Orange” will still be honoured at the fundraising event along with former Expos greats Andre Dawson, Tim Raines, Vladimir Guerrero and Andres Galarraga. For more information on the Gala, follow this link. • This week’s trivia question: The Montreal Expos retired No. 10 for both Rusty Staub and Andre Dawson. Staub wore No. 10 from 1969 to 1971, while that number graced the back of The Hawk’s jersey from 1976 to 1986. But can you name the player who wore No. 10 for the Expos from 1973 to 1975? Please provide your answer in the “Comments” section below. The first person to provide the correct answer will win a 1979 O-Pee-Chee Andre Dawson card. Thanks for the comment, Devon. Yes, it seems unlikely that O-Dog will be back after four years, but it would be fun if he did make it back. Great stuff as always Kevin thanks for the link to the MBP, I knew they were trying to get MLB back to Montreal but didn’t know their was a site to follow the progress and give information out. Thanks for the comment, Brent. The Montreal Baseball Project is a pretty exciting endeavor. Jim Cox wore number 10 for the Expos during the time you mentioned. Nice work, Jim. You’re correct. Drop me an email (kevin.glew@sympatico.ca) with your mailing address and I’ll mail the Dawson card to you. Thanks Kevin. I sure don’t remember him but at least I know where to find some answers. I really enjoy reading your Cooperstowners in Canada. Nice job. Thanks for the kind words, Jim. Wow, on the Riemer story. That’s great. I sure hope Dustin keeps his head up. He will get his shot just like Robinson got and Romak got. Bedard and Diamond I sure hope make it back. They both have some miles left in their arms. Thanks for the comment, Scott. I’m cheering for Molleken, Bedard and Diamond as well.